Why Undertale is one of the most important pieces of new media this decade. Apart from titles such as those in the Pokémon franchise—those which have been with me since childhood—I don't particularly like role-playing games. In the (indie) gaming scene, it's typically not the RPGs that stand out to me; games based around other genres often captivate me more and are more enticing, despite the narrative structure and nature that role-playing games naturally have. I feel as if other sorts of games are much more personal—those with a focus on words and personal stories, such as Kentucky Route Zero, Night in the Woods, and various Twine projects which oftentimes fall under the category of interactive fiction. I don't particularly like Dungeons & Dragons or any traditional tabletop role-playing games either. So maybe they just aren't my thing. Or, I thought this was the case—until Undertale. "What happened to the explosion of formal experimentation during the early days of computer games? For a while it seemed that every other title was a fresh attempt to answer the question 'What can you do with a computer?' Compare that with the current crop of computer games, the majority of which seem to be addressing the question 'What can you do while controlling an avatar that is moving through a simulated three-dimensional space?'" This is a question that's been with me recently, and aspects of questions such as these are reasons I'm drawn to the indie gaming scene, where advances in "what games can be" are, at times, made. Independent games are a lot more up-close and personal, designed by small teams and influenced by the common person. There's a closeness about them, and in a way they're able to hit home harder than big-budget/AAA titles. Even if some are just different takes on platformers or RPGs, it is endless, personal, narrative structure that allows these variations to break free of their genre. Undertale has done this. Undertale's purposeful refusal to adhere to its genre boundaries is what makes it one of the most important pieces of new media this decade. While some games, at their core, should just be fun, others have the potential to be viewed as art. This is a claim contested by many, I'm sure, but we'll take it for granted here. (In short, I'm assuming games are indeed art—for starters, look at Dear Esther, Kentucky Route Zero, Journey, To The Moon, Proteus, Electroplankton, Lose/Lose.) So, as an art form, games are telling stories in unique ways that are very new to us. For narrative-based games, we're not used to both the level of interactivity and the level of storytelling involved. And this interactivity is a key feature of many games; while we may not physically interact with some games in the traditional sense, e.g. art games, we still interact with them as we watch them, experience them, consume them. So let's take a look at the balance of story and mechanics in narrative games. In Dear Esther, for example, there are no "mechanics" or options or choices, apart from simply walking forward, but players experience the story at a pace that is deliberate and chosen, their actions controlling the character and, thus, the story. But we ask: why is this a game? Is this a game? Why is this minimal player choice important? Is the medium conducive to the matter? Other games, such as To The Moon, attempt to tell a story while combining narrative and story-driven gameplay with mechanics of traditional video games. But the stories they tell are often watered down due to the mechanics which get in the way—the meticulous distracts and interrupts. It is Undertale's balance of mechanics and story that makes it work so well. There is complete ludonarrative harmony—a successful balance between gameplay and narrative. It's fun as a game in its own right—you have the traditional turn-based RPG elements, the throwbacks to Earthbound, the clever dialogue, the bullet hell mini-games, the puzzles. But it is also enjoyable on another level—the commentary it subtly provides about games, and about the way we play games; the ability to give the player full, complete control in everything they do; the commentary on how we experience morality in video games; the fact that we often control a character that may represent us, but is not us; the realization that the puzzles don't matter. "If we are going to reach our potential when innovation dries up, we need to be important. We need to speak to the human condition. We need to make games that people care about so much, they can't not play them." Blow's argument stems from the fact that games, and gaming platforms, need consistent innovation to be engaging and invigorating. Stories, however, don't need this sort of sustainability to be important to peoples' lives. He goes on to ask, "Why haven't we made games that address the human condition, even though we could start so easily?" What we need is feelings that come from gameplay and what the player does (e.g. as opposed to cutscenes), and we need sincerity. Undertale fulfills these needs. Its harmonic approach uses its game mechanics to communicate and convey an important narrative experience. Moreover, this narrative is emergent, not embedded, and is presented as elective rather than immutable—the player has actual control of their experience. 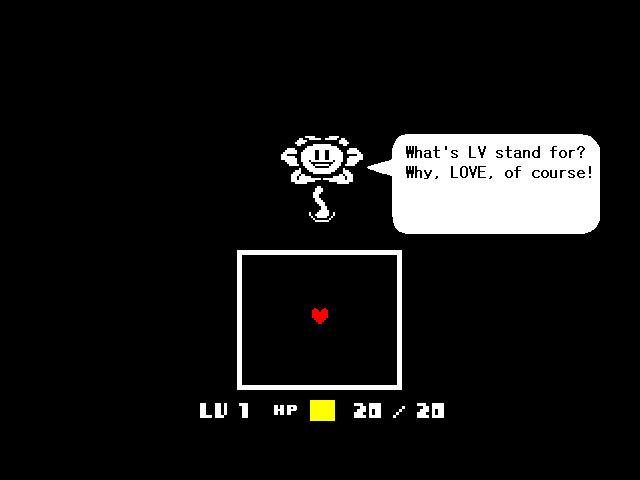 Ultimately, Undertale speaks to the human condition. To note: I've heard the word "post-modern" thrown around when discussing this game. While it's not my favorite of terms to use—it's a bit of a buzzword, meaningless in a sense—it is used for good reason. It's not the first game with post-modern elements, but it is the most fully-formed post-modern game. Let's break down and discuss our earlier claims. Naturally, heavy spoilers follow. How do you, as a player, interact with role-playing video games? Well, you play them, as you do any game. But specifically, you roleplay—habitually, as that "player character," as that answer to "Are you a boy or are you a girl?" And the first key choice you make is that of your [NAME]. So, [NAME] is the player you habitually roleplay in other RPGs. Uniquely in Undertale, this isn't true. I can't stress how new, and ingenious, it is to me that the name you choose at the start of the game—that one powerful label of identity—is not the character you're playing as, even when the text and backstory introduction makes it seem like it truly is. (I mean—"the fallen child"!? What else could that possibly mean?) We're so used to this formula, and it's something that's not often changed or questioned. When we realize that we, the players of games, are different from our in-game characters or avatars, we're forced to think—does that represent me? Is that "me," or is it someone else, and where does that person come from? Perhaps the most widely-discussed mechanic of Undertale is that of player choice—you can FIGHT or SPARE (choose to kill or not kill) any enemy. You're not forced to do anything. And the option to kill everyone, all these characters which you grow to care about, or even the random passerby encounter—that option is hard to do, because of how much critical introspection the game requires. One is not supposed to go through Undertale killing everything without a second thought, as typical in other role-playing games. Players must, at the very least, consider compassion. Undertale isn't a game about mindless violence, killing, or action without consequence (what some people think most "video games" are about), but a game about empathy and humanitarianism. Undertale subverts one's expectations; you can't play Undertale and not think. How easy is it for us to act on things when we're hiding behind false identities or pseudonyms? Who do our actions affect besides ourselves? Would we act this way in real life? Are games meant to be an escape from life, or to enhance life itself and the way we live? "Aren't you excited? Aren't you happy? You're going to be free." Undertale has enhanced my life, and I've gotten a lot from it. I can only hope that it will have the same effect on others. A quick note: From this point forward, this article will be a bit less focused on the narrative of Undertale and more on the mechanics, and on the game as a whole. I still touch upon themes of narrative, story, and writing, but they're not at the focus in describing how Undertale pushes boundaries. Breaking the serious tone characterizing the previous section, I really enjoy the fact that the puzzles don't matter. While they are a mechanic, and a part of the game, they're not an integral or important part of the game, and you don't need to be able to solve them. Undertale holds the player's hand—literally—as they are shown the way through the first few puzzles. Other puzzles unlock after failing a number of times, while others have switches hidden on trees or clever ways around them. You don't have to be "good at games" to enjoy Undertale or experience its story. You don't have to be skilled at bullet hells, or dodging, or having good hand-eye coordination, or reacting immeasurably fast to events with no meaning. To take this one step further, you—the player—even have the chance to purchase an (albeit expensive) item that makes you fully invincible, if you have enough money. And the game also purposefully provides a way for you to get infinite amounts of money. There is always a way through. "Welcome to the library. Yes, we know. The sign is misspelled." Additionally, the writing in Undertale is spectacular. It's clever, immersive, funny, and fun. It's hard to deny that it's great that there's a skeleton named Papyrus who speaks only in the font Papyrus, and his brother Sans who speaks only in Comic Sans. And these comedic elements, too, fit in so well with all the other mechanics. And oh boy, the mechanics are great. At the start of the game, you're presented with a box with a heart in it. This is the culmination of your soul, and you're able to navigate within this box, or field, to dodge attacks from enemies, like a top-down view of a player moving in 2D space. And for roughly the first fourth of Undertale, this is how combat (or lack thereof) works. On the road to Snowdin, the player is introduced to blue attacks—attacks that are light blue in color, that don't harm the player when they stand still. One learns that to survive, they must not dodge attacks as expected, but rather stand still and let the attacks phase through them. Players are forced to learn this through multiple scenarios. So when the first (hilarious, wonderful) boss of the game, Papyrus, gives it his all with his legendary, fabled "Blue Attack," you feel smart—smug, even—just through your ability and knowledge to stand still. And then you're blue. Dark blue. And you fall, and you get hurt. Because when you're dark blue you're affected by gravity. "You're blue now. That's my attack! Nyeh heh heh heh heh heh heh heh heh!!!" The playing field is no longer a top-down view, but rather a side view. But nothing's changed other than perspective—your view of what the game really is, and the environment in which you exist. As players progress, the game continues to play with this in other inventive ways: giving you a shield, letting you be invincible only while explicitly moving, being forced to move in discrete steps with vertical movement but having horizontal mobility, and so on. In Undertale, you learn to love, not fear, the unexpected, even when you fail. But the climax of these ways of thinking about game space comes during the final boss battle of the genocide/"no mercy" route, after the player goes through the game killing everything in his or her path. As Sans the skeleton prepares his final move, his last resort, he speaks: "Here goes nothing." And that's his move—nothing. Sans refuses to take a turn, effectively making his turn last forever. Is he playing by the rules? No. But what he does turns turn-based role-playing games on their heads. And, truly, were there rules? The guidelines are only that which you, the player, expect—but you were wrong, and you sort of like it. Even if you're playing as a ruthless murderer, Undertale inspires humility. Aside from genre specifications and meta-game commentary, Undertale consistently breaks the rules. Depending on how you play the game, you can be the evil-doer, the nemesis, the villain, the one the in-game characters are trying to stop (a trope also present in Braid, albeit much less directly). And if you choose to do this, rules will be broken to try and stop you. You can be attacked in menus by Sans when choosing your move. In other paths, the "true" final boss Flowey is capable of savescumming, saving and loading and re-loading your save file to gain an advantage against you. Asgore tears apart the MERCY option with his scythe, forcing you to temporarily relinquish pacifism. Through determination, you refuse to die to Asriel. Defeating Sans requires not only immense skill, but patience. The way to victory in battle is to wait for him to fall asleep, and then move the game field, the confining box in which you exist over to the FIGHT button, allowing you to "reach" the option to kill him. "You'll just keep going. Not out of any desire for good or evil… but just because you think you can. And because you 'can'… you 'have to'." The key characters of Undertale are philosophical, wise, and powerful, beyond what is typically allowed or expected in the realm of a game. Their dialogue and implied knowledge of both the game and the player, among further critical aspects, show that in-game characters are aware of the world outside of the game. It is this meta-awareness that pushes boundaries. It is this meta-awareness that leads us to answers, and helps create meaning. How do we re-define game space? How do we strengthen our connection with the machines on which we're playing these games? What are the constraints of a game? "What can you do with a computer?" Don't have the heart to go through killing everyone, but still want to see what happens? Just because you're watching instead of playing the game doesn't make you exempt from judgment: > "'I don't like this,' I told myself. 'I'm just doing this because I HAVE to know what happens.' [...] At least we're better than those sickos that stand around and WATCH it happen… Those pathetic people that want to see it, but are too weak to do it themselves. I bet someone like that's watching right now, aren't they…?" What's even more incredible is that the game remembers nearly every action you take. You're told that you always have a choice, so if you do kill a monster accidentally, or on purpose, the game will make sure you won't forget it, even if you quit and play the scene over—and having a change of heart may taint all future playthroughs with your murderous spirit, making any happy endings unachievable. In undertaking play of Undertale, the player must be open to interacting with the game in its entirety, not only within the game window. To unlock some secrets, players must close and reopen the game multiple times. To be given another undeserved chance after causing a bad ending, players must not play the game for a set amount of time. One must even edit save files in order to truly unlock all of the game's Fun secrets. With the power to SAVE, load, and ERASE, doesn't that make you God? But, at one point, the game purposefully crashes itself—so it seems there's another contender on the playing field. "Our reports showed a massive anomaly in the timespace continuum. Timelines jumping left and right, stopping and starting… until suddenly, everything ends." So why is this meaningful? Intrinsically, it's not. But it is different—very different—and unexpected. There's no denying Undertale requires a different mindset than most games, and playing it makes us aware of these norms and variations on the mold. It is from this that players may garner individual meaning. On top of this all, the soundtrack is absolutely top-notch. (I really do hesitate to mention this, as it does perhaps make the tone of this article a bit closer to that of a traditional review, as opposed to one focusing on the meta-awareness, meaning, and narrative significance of the game. But it's just so good.) While it's better to listen to the music in context and while playing the game, it's hard to resist giving high praise to at least a few tracks, such as "MEGALOVANIA," "Battle Against a True Hero," "Hopes and Dreams," "Bonetrousle," "Waterfall," or "Undertale." And it's not great for "video game music," but for music. It's invigorating, emotional, and even clever (especially in its use of leitmotifs). This isn't anything new in games, but it's still wonderful. For the busy reader: Undertale has at least five dogs and you can date a skeleton. Please play this game. Who knows. Maybe, one day, it'll help you SAVE the World. Last revised December 22, 2015. 2915 words.